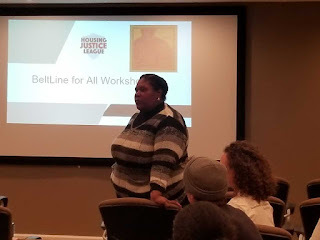 On February 8, Housing Justice League’s BeltLine for All campaign held the first of four workshops in our BeltLine for All popular education workshop series. 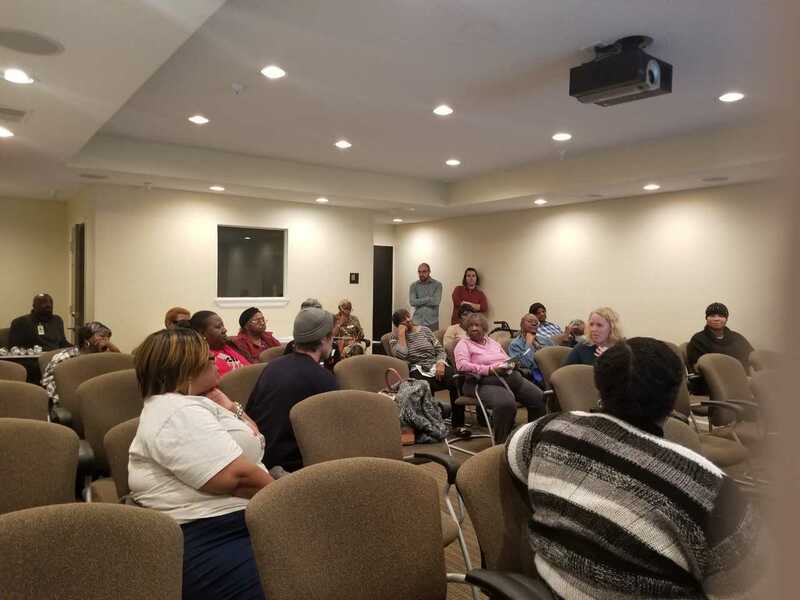 The workshop took place at Heritage Station Apartments in the Pittsburgh neighborhood just south of downtown. The evening’s discussion featured Housing Justice League’s recent community-led research project which focuses on the development process of the BeltLine and the effects it is having on rising costs and displacement in low-income communities, especially in the Southside. The central message emphasized throughout the workshop was made clear: “We have to get organized!” You too can join our campaign by reading and signing our petition to tell policymakers that it is unconscionable for a city with resources as great as Atlanta’s to incentivize the continued extraction of wealth from our communities. While issues of disinvestment and political marginalization in Southside neighborhoods are nothing new and are well understood by longtime Southside residents, Housing Justice League understands our research on the BeltLine as a way for residents to consider present-day manifestations of racism in public policy and the imminent threat gentrification is posing in Atlanta. In entering these conversations we understand that we are “preaching to the choir,” as one Pittsburgh resident put it. But we also know that as racism and exploitation are fought, they evolve to evade public awareness and criticism, all the while continuing the same basic function: maintaining the power of an elite minority and destroying practices of democracy that uphold political priorities of equity and justice. For this reason, our workshop linked the historical patterns of racial segregation and disinvestment to present-day “public-private partnerships” that give power to private investors and break apart low-income communities of color. Historically, the federal and city governments channeled public money into the suburbs and deprived the Black “inner city” of needed public infrastructure and social services through practices like redlining, federally-backed housing mortgages for whites, and highway construction. In the 1990s the Atlanta city government destroyed public housing and began a shift away from public authorities control of urban development towards control by private investors. Alison Johnson, member and longtime resident leader with the Housing Justice League emphasized the loss of not only housing during this period, but also an organized political force of tenants who were able to make strong demands of local government. The destruction of public housing complexes was a direct attack upon the social networks and housing stability that helped make these forms of social and political organization possible. Can we count on you to sign and share the #Beltline4All petition? Corporate elites pushed for policies that gave tax cuts to the wealthy and turned government-controlled public services over to the whims of for-profit private corporations. This was exemplified in the 1990s through the development of the Georgia Dome and the Olympics Stadium which had catastrophic effects for surrounding communities. Because cities lack funding and are controlled by for-profit interests, they rely more on “privatized” models of urban development that depend on attracting private investment. It is easy for investors to buy out black communities and make a profit because land is cheap from decades of disinvestment and the government does not protect the poor against rising prices and displacement. In our workshop, this information served as context for explaining the effects of the public-private partnership overseeing the BeltLine’s development, which is spurring on patterns of gentrification and displacement on a large scale. The BeltLine is displacing residents at an alarming rate as rents and property taxes along its path path shoot up, and its plan for developing affordable housing is far behind schedule. We are losing affordable housing in Atlanta at a rate far greater than the rate at which it is being built. The BeltLine for All campaign team’s goal is that this information can serve as an alert to the immediacy of the threat of gentrification in Southside communities and as a starting point for collective action on whatever residents identify as the most pressing issues that they want to take on. Following our presentation we opened up a discussion to talk about different concerns and what action the community might consider taking. We heard residents’ own observations about the rapid changes occurring in Pittsburgh and other issues the community faces. One of the issues that came up the most was the train consistently stopping across McDaniel Street, blocking traffic for hours or even days at a time and disrupting neighborhoods blowing its horn often as late as 2:00 a.m. One senior resident commented, “I’d like to see that train not inhibit my health,” explaining that the train poses a very serious danger to seniors at Heritage Station because it could cause a delay in getting to the emergency room. Can we count on you to take the #Beltline4All pledge by signing and sharing the petition?